Sometimes, I try to hit up an entire city block in hopes of visiting each restaurant one-by-one. That was my original plan for the last block on lower Lonsdale in North Van. Yet, the hockey team has only been to both Raglan's and The District twice in addition to Burgoo (on a family outing) without completing my mission. 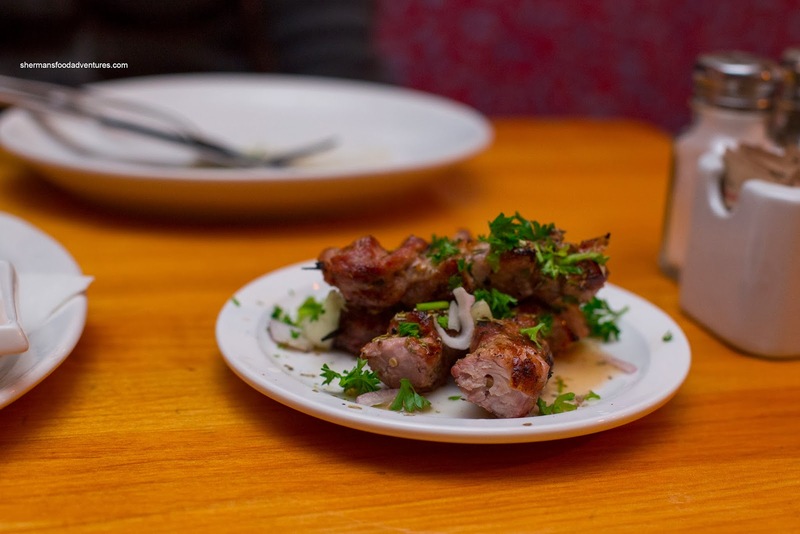 That meant Anatoli Souvlaki and Gusto di Quattro were shutout (partly due to their earlier closing hours). Now I have been to both during Tasting Plates, but honestly, I personally do not consider those to be legitimate visits (due to trying one or two items of food only). 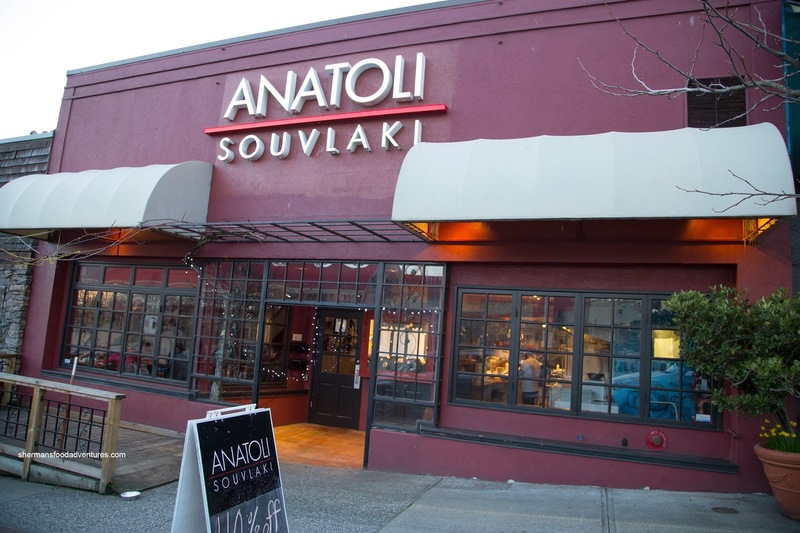 That would all change when I got an invite for a tasting at Anatoli. Since I could only eat so much by myself, I enlisted the help of Emilicious. 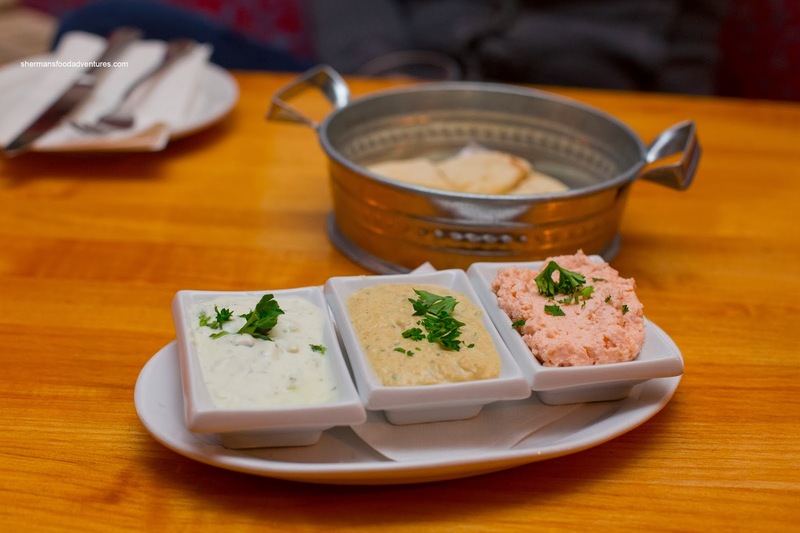 We started with some Pita Bread with Tzatziki, Humous and Taramosalata. I liked how the pita was slightly crispy on the outside while retaining a soft interior. Beginning with the tzatziki, I thought it was good combination of cucumber and lemon. I would've liked it to be thicker though. As for the humous, there was an immediate garlic punch. I liked that it was smooth without being over-processed. Lastly and my favourite, the taramosalata was really pungent and thick. I could taste the cod roe and the accompanying saltiness. I liked this one more than the recent version I had at Blue Water. Moving onto the next dish, we sampled the Dolmathes. 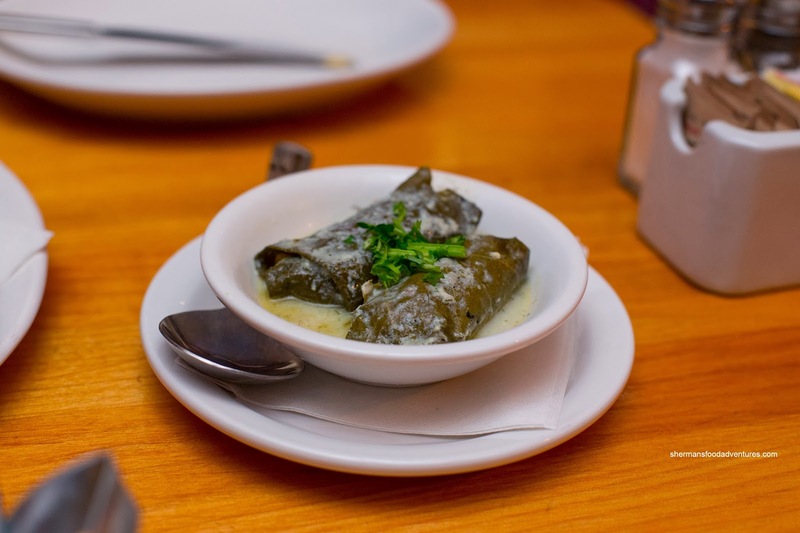 The firmness of the grape leaves was a nice textural contrast to the moist rice and beef filling. We liked the lemon sauce as there was just the right amount of acidity and not overly thick. Next, we had the "The True Greek" Pork Souvlaki. These were the beneficiary of proper grilling where there was charring without being burnt. Although pork calls for a complete cook through, these were still moist and fairly juicy. The flavours were there (especially on the outer bark), yet we would've liked a bit more lemon in the marinade. 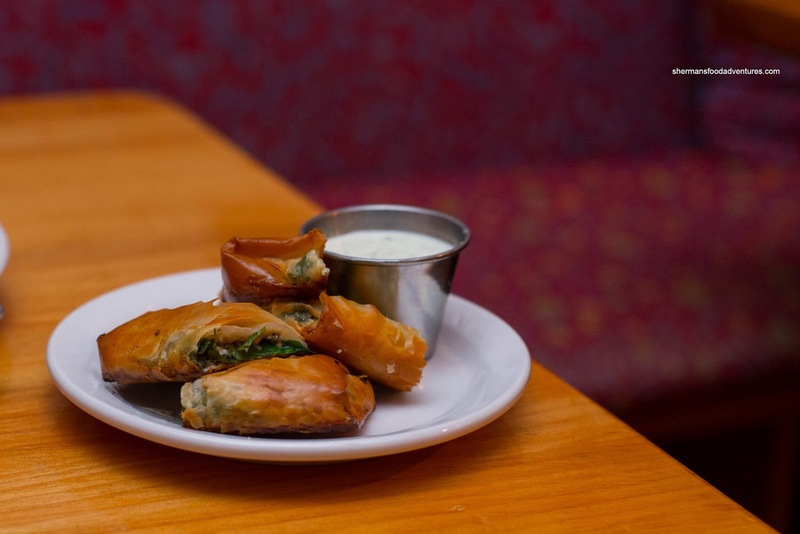 With a golden exterior, the Spanakopita was really crispy and flaky. Even with the ample amount of filling, the phyllo did not moisten. About that filling, we found the spinach to be texturally and visually on point. It was still vibrant with some crunch. There was enough feta cheese for balance and a touch of creamy gaminess. The side of tzatziki wasn't even necessary as these were good on their own. 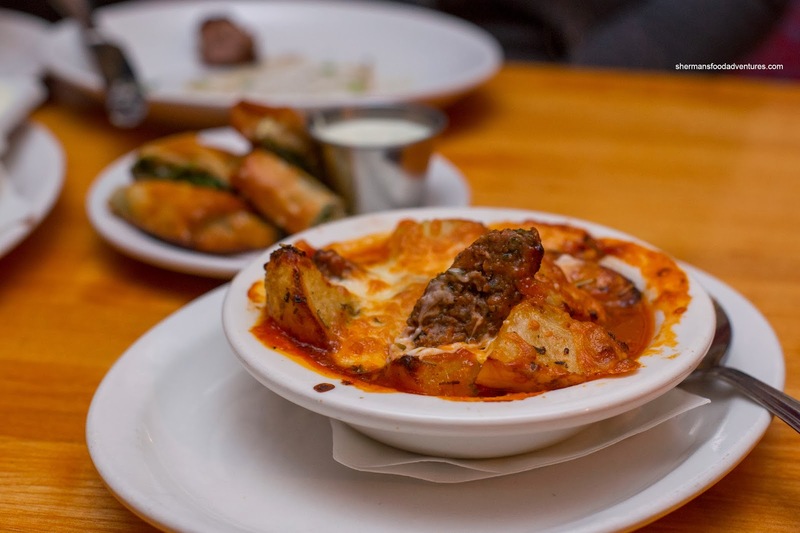 Continuing on, we had Niki's Meatballs with potatoes in a tomato sauce and baked with cheese. Apparently, they used some cinnamon in the sauce, but at first, I didn't taste any. However, upon further inspection, the tart tomato sauce partially hid the cinnamon until the finish. We liked the potatoes as they were soft and lemony while the meatballs were moist and a bit spongy. 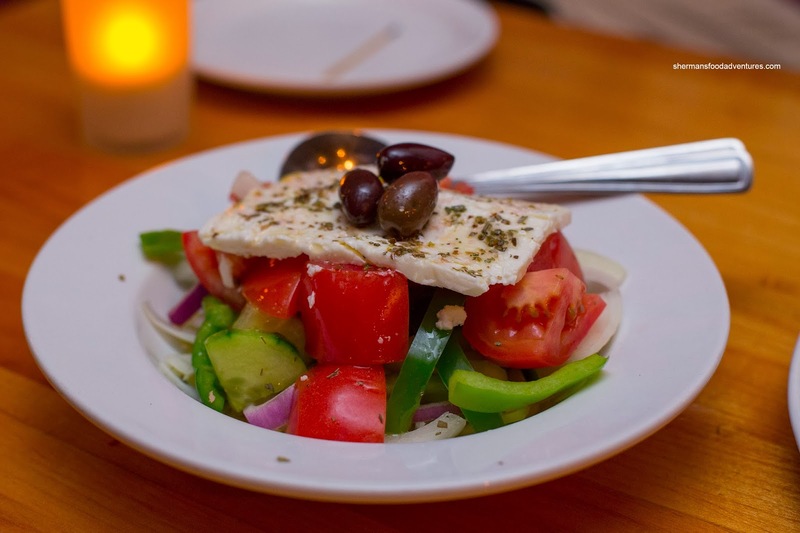 Normally, I don't think much about a Greek Salad because it can be pretty generic. Not this one as it featured a big slice of Dodonis feta (with oregano) on top. This was literally the cherry on top of a really well-constructed salad. With vibrant and crunchy veggies tossed in olive oil and lemon, this was notch above the regular. With the cap left on, the Rack of Lamb, prepared medium, was super moist as a result. 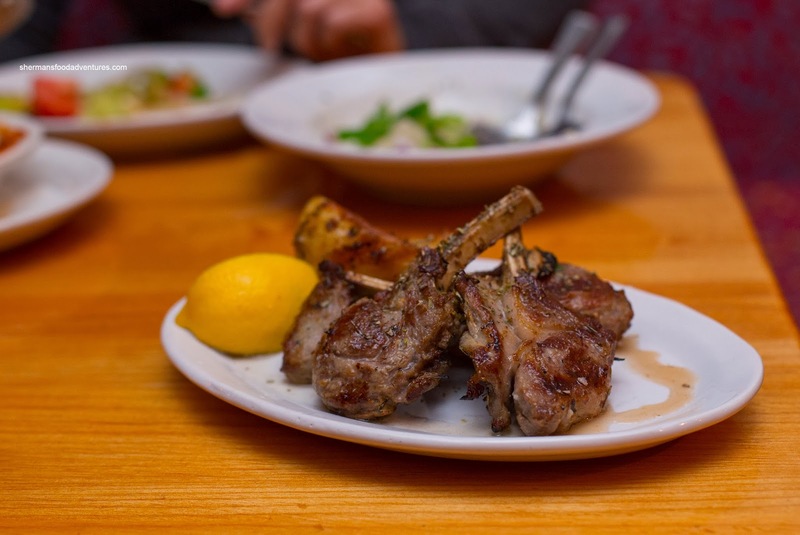 With a squeeze of the lemon wedge, it helped balance the savouriness of the lamb chops. I thought the natural flavour of the lamb really came through due to the inclusion of the fat. 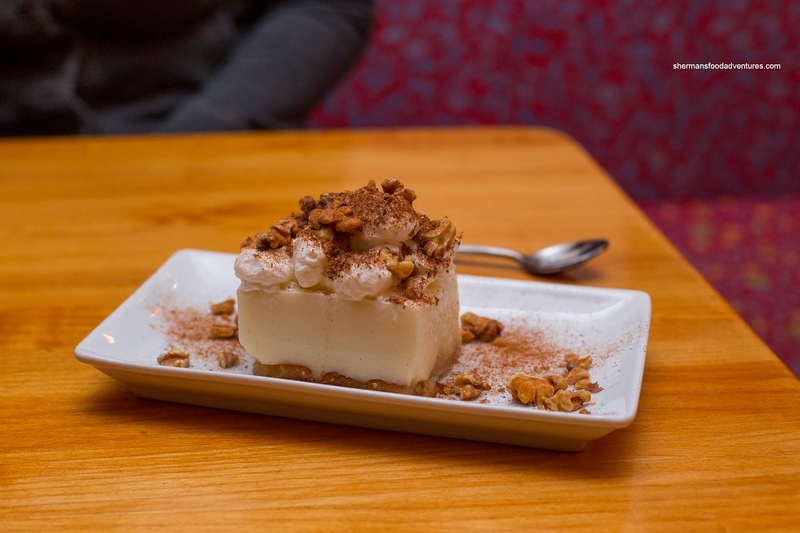 For dessert, we were served Ekmek. This was probably the only thing that we weren't fond of. Unlike previous versions I've had, the filling was not custardy. Rather, it was more like a really stiff pannacotta. With that being said, I did enjoy how it wasn't overly sweet with a dusting of cinnamon. Dessert withstanding, everything else was on point and tasty. In the end, I was glad to be invited so I could finally see what I was missing out.